Mario & Wario is a single-player only title which was only released in Japan, it was another title that utilised the SNES mouse which didn't make it out of Japan. In this game the player plays as a fairy named Wanda, guiding Mario (who is blinded by the Barrel or other object that Wario stuck on his head at the time) to his brother Luigi before time runs out! If Mario falls into any traps or dies, the level is restarted. 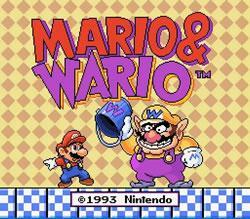 Mario & Wario features more than 100 challenging levels. There is no save feature for this title which is maybe another contributor to the reasons that this otherwise fun and unique game was not published in the rest of the world. World 1 - The Fairy's Woods - This world is comparatively short and simple - it acts as a good level to break a new player into what the game is about. There arent any enemies here. World 3 - Cloud Mountain - This world shows the introduction of the first Block Panels which expire, after they expire Mario can fall through them again so beware. World 4 - Ice Cave - A world based on Vanilla Dome from Super Mario World, this icy wasteland has sticky blocks that appear at random. World 5 - Fire Cave - Things start to heat up a little in these caverns with the introduction of Tsuboons which breathe fire at you. World 10 - Wario's Castle - After successfully completing your adventure through Wario's garden you are able to take on the "final" level, Wario's Castle. Extra World - This bonus world is unlocked after beating Wario's Castle. It should also be noted that after beating each world you get to play a bonus stage where Wario flies past on his plane, each hit on Wario and his plane will gain the player a coin. If Wario is hit enough times the plane will blow and Wario will be blown out of the sky.